As I’ve mentioned in previous posts, I’m a slightly obsessed jewelry fanatic and collector. I have a huge collection of jewelry, and although the majority of it is not made up of rare, antique, one of a kind, super valuable, signed or difficult to find pieces, they are all treasures to me. The most interesting jewels I have are the estate pieces I’ve collected. One in particular actually is a treasure. 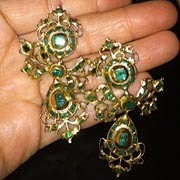 A pair of Late Georgian period Spanish Emerald earrings. The Georgian period stretched from 1714 to approximately 1837, during the reigns of George I, II, III and IV, in Great Britain. My earrings date from the late 18th century, around 1780. The earrings are set with square, table cut emeralds, in a yellow gold (probably 15 kt), ornate, scroll pattern openwork setting. The back of the setting is closed, and the stones are probably foil backed. Foil backing was a popular jewelry setting technique of the period, where a sheet of a colored foil lined the setting to enhance the color of gemstones. The earrings are a pendeloque style, which was a popular look during the Georgian period. They are basically a pear shape drop suspended from a bow shaped center with a cluster top at the ear. I had the original ear hook removed and replaced with a post, for easier wear. However, it’s generally never a good idea to alter antique jewelry, because it is more valuable in it’s original form. Well, after this discussion about my earrings I can’t wait to wear them out, it’s been awhile! Sometimes, half the fun is just knowing you have something in your jewelry box, not necessarily wearing it. Spoken like a true jewelry hoarding collector freakshow!! !